Our goal at Vinland Lutheran Preschool is to foster a life-long love of learning while demonstrating Christian values. We serve children in a relationship-rich, educational envirnment centered in the love of Jesus Christ. We offer an environment that allows the children to develop self-confidence, independence and social skills, while giving them opportunities to grow physically, emotionally, and spiritually. Our approach uses an interactive, thematic curriculum that nurtures the whole child. Our focus is on learning by hands-on experience. We offer a wide variety of opportunities that ultimately prepare students for kindergarten. We invite you to come tour our wonderful facility. The classroom is spacious and full of light. Children can explore dramatic play, art, sensory table, blocks, library, puzzles and manipulatives. Teachers switch up the offerings daily, so the space is always engaging for our students. The outdoor space offers playground equipment, sandbox, meadow area, raised garden beds and forest trails. All are fenced and maintained for safety. Minds AND bodies are being challenged and nurtured in this learning environment. Potty training is not required for any of our classes. We believe children benefit from a rich preschool experience, regardless of their potty-training progress. Vinland Lutheran Preschool is a ministry of Vinland Lutheran Church, which proclaims and shares the love of Jesus Christ. The Preschool admits students and families of any race, color, national and ethnic origin. Church membership is not required to attend the preschool. 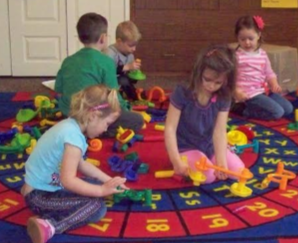 The Preschool maintains membership with the Evangelical Lutheran Education Association (ELEA).